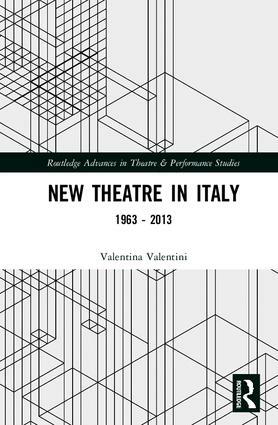 New Theatre in Italy 1963-2013 makes the case for the centrality of late-millennium Italian avant-garde theatre in the development of the new forms of performance that have emerged in the 21st Century. Starting in the Sixties, young artists and militants in Italy reacted to the violence in their streets and ruptures in the family unit that are now recognized as having been harbingers of the end of the global post-war system. As traditional rituals of State and Church faltered, a new generation of cultural operators, largely untrained and driven away from political activism, formed collectives to explore new ways of speaking theatrically, new ways to create and experience performance, and new relationships between performer and spectator. Although the vast majority of the works created were transient, like all performance, their aesthetic and social effects continue to surface today across media on a global scale, affecting visual art, cinema, television and the behavioural aesthetics of social networks. "This is a much-needed volume that helps to fill in a neglected Italian theatre history in contemporary scholarship. The authors offer wide-ranging discussions of many prominent groups, actors, writers, and events within the context of Italian society and culture from the post-war period to the present. Important manifestoes, theories, singular works, and shape-shifting ideas define this survey of Italian theatre through the many trajectories of the avant-garde, the changing role of the actor, group collaboration, the interplay of text and voice, and the turn from the human to the digital image." Bonnie Marranca, Editor and Publisher, New York. 4.2. Living in Transition. The Balance of "Pregress"
Valentina Valentini is full professor of Performance Studies and New Media in the Performing Arts Department of the Università "La Sapienza" in Rome, the city's principal university, where she serves as Director of the Centro Teatro Ateneo, a research center on performing arts. This series is our home for cutting-edge, upper-level scholarly studies and edited collections. Considering theatre and performance alongside topics such as religion, politics, gender, race, ecology, and the avant-garde, titles are characterized by dynamic interventions into established subjects and innovative studies on emerging topics.